Last Friday, students packed themselves into the Loch for the ten-year anniversary of MacSlams. 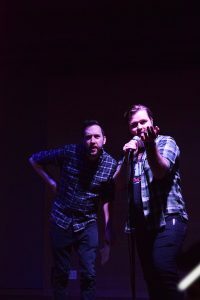 Formed in 2009 by Neil Hilborn ’11 and Dylan Garity ’12, who returned to the Macalester campus to facilitate the event, MacSlams allows anyone to recite their poetry in front of an audience. With seats filled and popcorn popped, the audience was prepared to hear Macalester poets perform what they had been working on in their weekly MacSlams workshops. The event began with an open mic, during which anybody in the room could come on stage to share their poetic endeavors without being scorned. After a striking poem on narcissism and a wonderfully irreverent take on lawn maintenance, the crowd had seen poetry muscles flexed and was ready for the rest of the night. Judging during MacSlams is informal. In order to maintain impartiality, judges are selected from the audience and give their untrained gut reactions. On a scale of one to ten, they write their scores on whiteboards in full view of the audience. Although this immediate feedback might seem stressful for the poets, the judges aren’t so safe either. As a part of the larger philosophy of audience participation, cheers and jeers directed at the judges are a welcomed practice when the scores are considered low. Following a “sacrificial” poem, which was not part of the official Slam competition and purely set the standards for scoring, the first poet took to the stage. The night flew by in a wave of metaphors and vulnerability. The six poems performed were sometimes impassioned, sometimes heartfelt and sometimes oblique. Topics ranged from Tinder dating, gender dysphoria, family drama and everything in between. Hilborn and Garity introduced poets and read scores in a hilarious fashion. The two drew on a comfortable and roughhousing dynamic, shooting out jokes and friendly insults towards one another. Throughout the slam, they reminisced on their own days at Mac, the founding of MacSlams and a number of other anecdotes relating to the student poets. Hilborn told one particularly relevant story from his first Minnesota winter, when he foolishly walked outside after a shower and broke off an entire piece of his hair. MacSlams proved to be a path to poetry success for both of its founders. Hilborn and Garity have gone on to work with Button Poetry, a Twin Cities-based poetry company that has produced viral videos of slam poetry, including those by featured poet Rachel “Raych” Jackson. Jackson, a poet, playwright and educator in the Chicago Public School system, brought her work to Friday’s Slam, performing poems about her sordid relationship with religion and spirituality during her childhood. Her poetry often reflects her bubbling personality. “I Ask What ‘Circumcision’ Means in a Full Sunday School Class,” is exactly what its title suggests, a joyous celebration of indignance and resistance in the face of her overbearing environment. But, like many other poets who performed, Jackson’s poetry walked the line between playful and harrowing, covering issues of anxiety and depression. Dipping in and out of darkness, Jackson always kept a comfortable dynamic with the audience, pausing her performance to comment briefly on her thought processes and prompting audience engagement on some of the most outrageous and fun moments. The slam continued after the lovely guest appearance. Going back through the list, each poet got another chance to perform, treating the audience to another round of indulgence in words. The audience kept booing at judge’s scores they thought were too low, as the poets’ impassioned performances drew out the latent poetry fan in everyone. In a blazing victory lap, the spirit of MacSlams was out in full force. Ten years is a big milestone, and, even though Hilborn and Garity have long since graduated, MacSlams shows no sign of going anywhere. The current talent and passion put out by Mac students with a penchant for poetry carries MacSlams forward. This special event is only the beginning for MacSlams’ spring semester, which marks the beginning of slams which are no longer qualifiers for College Unions Poetry Slam Invitational (CUPSI), an international college poetry tournament in which MacSlams participates annually. The team that was formed last semester will be traveling the country later this spring, taking Macalester poetry on the road. In the meantime, they will continue facilitating monthly slams that are ready to fill up the Loch for another semester.